I was desperately afraid of rejection for the biggest part of my life. I was rejected early on for not being pretty enough, not quiet enough, and definitely not skinny enough. I was rejected by peers, boyfriends, and family members in both big and small ways. However, the most important rejection was one I was not even consciously aware of: I REJECTED MYSELF COMPLETELY. The fear of rejection became the driving force behind my vow to avoid rejection at all cost. I remade my appearance to the best of my ability, and surrounded myself with “safe” people who would or could not easily reject me; mainly people with wounds, obsessions, and weaknesses of their own. I also made sure that I became irreplaceable in the lives of these friends, so they would never want to leave me. Through manipulation and lies I kept this all alive. I pleased, begged, fought, over committed myself, did things I hated, smiled when I wanted to cry, stayed awake when I wanted to sleep, had long talks when I had nothing more to say, bribed, gave advice, bent over backwards, and last but certainly not least, rescued everyone around me. Finally after allowing God to untangle my heart from the huge mess of being tangled up with other people, I asked the question that needed asking a long time ago: Why am I so terribly afraid of rejection? His voice was clear and the message so simple: You have to stop rejecting yourself. You have to start loving the girl I made, and give her some room to grow and live. You have to let Her breathe and start pleasing her God instead of people. Other people are fickle. The ones who love you today might reject you tomorrow, but through the years, and all of your life, you have YOU an ME. What about you dear friend? Are you terribly afraid of rejection? Has it maybe been the driving force behind so many decisions and actions in your life? Is fear of rejection maybe at the root of your desire to be thin at all cost? Is your obsession to please others maybe driving you to the numbing effect of food? 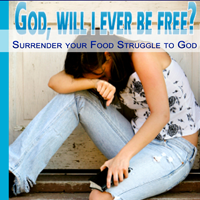 Have you rejected yourself and as a result need to soothe the pain with food? If we reject ourselves, then other people’s rejection is just too much for us to bear. If we criticize and hate ourselves, then other people’s criticism drive us over the edge, and many times make us reach for a substance to soothe the pain. It is when we are secure in our God and truly accept ourselves that we can handle what others throw at us; the good, the bad, and the ugly. I implore you to open your heart before the King of kings if you also fear rejection. Fear is from the enemy. Repent and allow God to flush out that fear and fill your heart with His incredible love and acceptance. I really enjoyed the rejection letter. It has not only been the driving force in my life, but has multiplied. But now my heart has turned cold and Jesus said that he would spit me out of his mouth, because I am neither hot nor cold. I know that he will never give up on me…yet my life is a mess. My husband has been very patient with me…but I believe that the Lord showed me if I did not start turning to him and away from this that he was going to leave me. I am at the point where I want to give up. Please pray for me.